I had to set this up for a client this week, I’ve setup a DMZ on a 5505 before and I’ve setup other VLANs to do other jobs, e.g. visitor Internet access. But this client needed a secondary VLAN setting up for IP Phones. In addition I needed to route traffic between both the internal VLANs. I did an internet search and tried to find some configs I could reverse engineer, the few I found were old (Pre version 8.3) ones and the little info I got were more people in forums asking why theirs did not work. So I built a firewall with 8.2 code, then worked out how to do it, then upgraded the firewall to version 9.1. Finally I picked out the relevant parts of the upgraded config. Here’s the scenario I’m going to use for this example. Before we start, yes I know the ASA is a firewall not a router! A better solution would be to have either a router behind the firewall or, (as is more common) a switch that is layer 3 capable, i.e it can route. Your ASA MUST have a Security Plus licence to be able to do this. Check your license version. The commands you use will be different if your firewall is running an operating system earlier than 8.3, check your ASA version and proceed to the correct set of commands. 1. Connect to the firewall, go to enable mode, then go to configure terminal mode. 2. 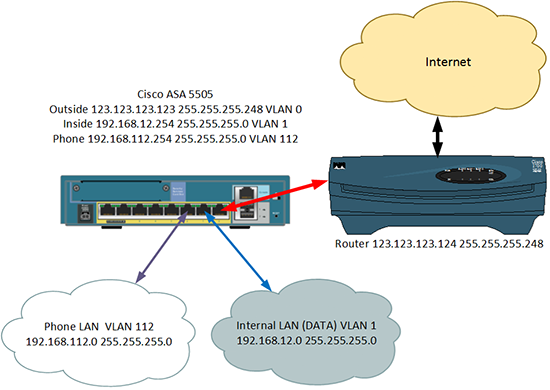 As in the diagram (above) I have three VLANs, VLAN 0 is outside and will be connected to Ethernet 0/0. VLAN 1 is inside and will be connected to Ethernet 0/1. VLAN 112 is for my phones and will be connected to Ethernet 0/2. Here I setup the IP addresses, and add the VLANs to the physical interfaces. Note: I don’t need to Add VLAN 1 to Ethernet 0/1, because all ports are in VLAN 1 by default. 3. To get traffic working to the internet you will need to specify a ‘route’ to your outside router. 4. Turn on ‘Hair Pinning’ (the ability to route traffic back out of the same interface it came in through) and allow traffic to pass between interfaces. 5. Out of the box, if you have not configured any access-lists then you can skip this step, as traffic will flow from a more secure interface (the inside and the phone one) to a less secure interface (the outside one). Here I’m going to use an ACL and allow all traffic anyway. 6. Now setup ‘dynamic’ NAT so that all traffic leaving both the inside VLAN and the Phone VLAN network get NATTED to the public IP address. 7. Now setup ‘static’ NAT so that traffic travelling between the inside VLAN and the phone VLAN does NOT get NATTED. 8. Enable routing, and set the MTU for all three VLANs. 9. Save the changes, and give it a test. 2. 2. As in the diagram (above) I have three VLANs, VLAN 0 is outside and will be connected to Ethernet 0/0. VLAN 1 is inside and will be connected to Ethernet 0/1. VLAN 112 is for my phones and will be connected to Ethernet 0/2. Here I setup the IP addresses, and add the VLANs to the physical interfaces. Note: I don’t need to Add VLAN 1 to Ethernet 0/1 because all ports are in VLAN 1 by default. 4. Turn on ‘Hair Pinning’ (the ability to route traffic back out of the same interface it came in through). and allow traffic to pass between interfaces. 6. Enable NAT so that all traffic leaving both the inside VLAN and the Phone VLAN network get NATTED to the public IP address.